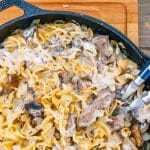 From thru-hiker forums to the halls of REI, it’s a well known among backpackers that beef stroganoff is one of the best tasting dehydrated “meals in a bag” on the market. It’s warming, filling, and loaded with big savory, umami flavors. When we go backpacking and don’t feel like cooking, nine times out of ten we’ll pick up a bag of stroganoff. We’ve even done a few multi-day hikes where we ate stroganoff every other night. It’s just that good. But what about car campers? 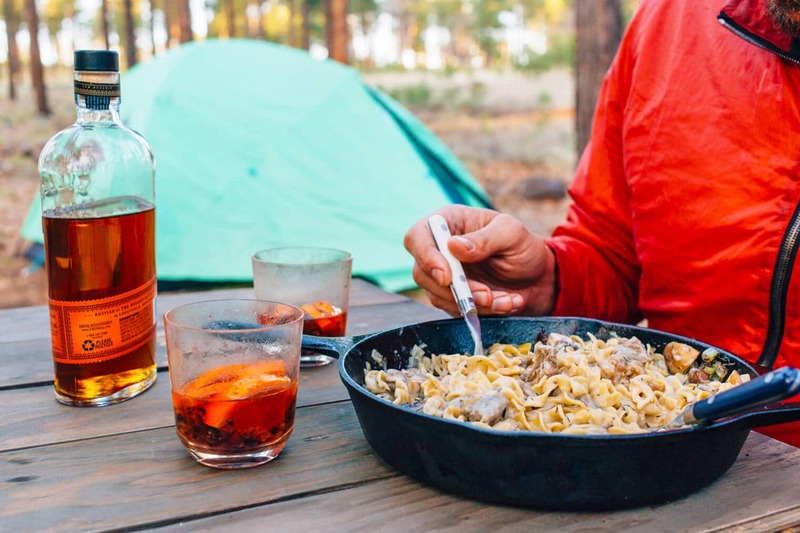 Eating a dehydrated meal seems a little silly in the front country, but making traditional beef stroganoff is too much of a project at a campground. 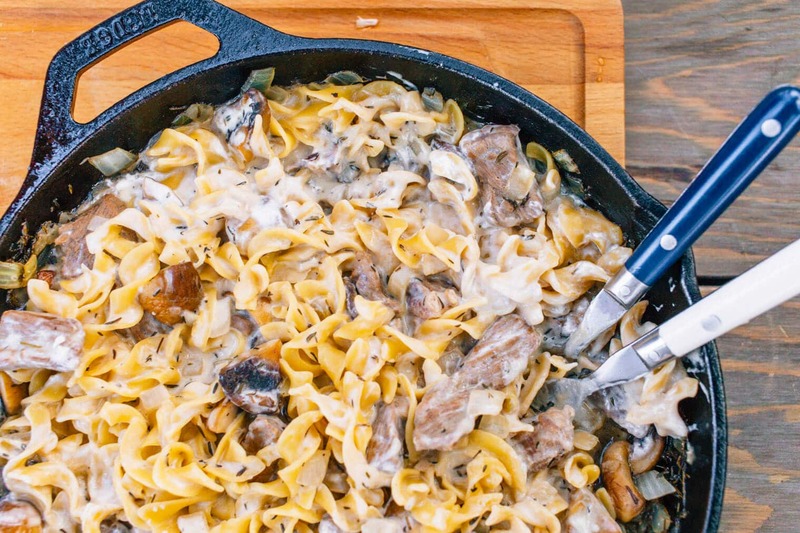 What if there was a streamlined, simplified beef stroganoff that had all the flavor of fresh ingredients, but also wasn’t a total hassle? Is there a way to make it into a one pot dish? We endeavored to find out. We did a lot of research beforehand and tested different versions, both in a kitchen as well as out in the field. Our goal was to keep the flavors while removing any non-essential elements. We tried a couple different types of steaks (ribeye, flank, strip steak), tinkered with the egg noodle to water/broth ratio, and tested to find just the right amount of soy sauce and sour cream. It was one of our more extensive (and delicious) recipe development processes. 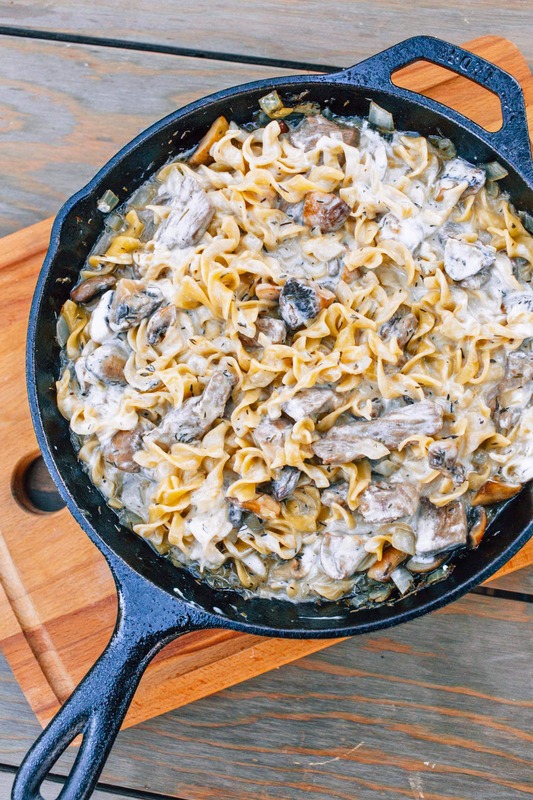 In the end, we came out with a one pot beef stroganoff that’s worth every single second it takes to prepare. While it definitely takes more time and energy to prepare than pouring hot water into a dehydrated packet, we guarantee you that the flavors you get are so so so worth it. Quarter the mushrooms and dice the onion. 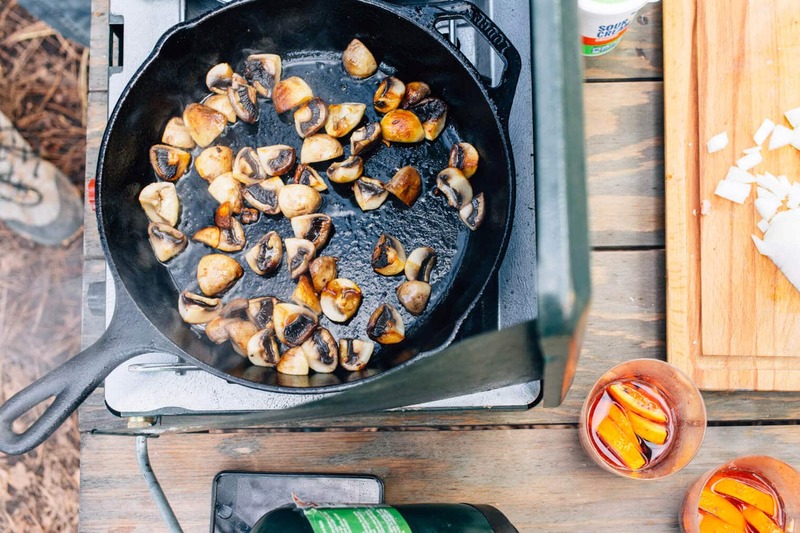 Heat the oil in a heavy bottomed 10” skillet until smoking hot. Salt the strip steak. Add the steak to the skillet and cook, until browned on both sides and cooked through. Remove from the skillet, tent with foil, and allow it to rest while preparing the vegetables and noodles. Reduce heat to medium. Add the mushrooms and saute 5 minutes, stirring infrequently. Add the onions and continue to saute an additional 5 minutes. Add the broth, Worcestershire sauce, and thyme. Use a wooden spoon or a spatula to scrape up any brown bits on the bottom of the skillet. Bring the liquid to a boil over high heat. Add the noodles and cook according to package instructions (this will depend on the noodles you buy - ours took 8 minutes), stirring occasionally to ensure the noodles cook evenly. Once the noodles are tender, remove skillet from heat. Temper half the sour cream with some of the sauce by adding a few spoonfuls of broth to the sour cream and stirring - this will raise the temperature of the sour cream and help prevent it from curdling when added to the pan. Mix the tempered sour cream to the pan, stir, then add the rest of the sour cream and stir to combine. Slice the cooked steak into bite-sized pieces, add to skillet, season to taste and serve! I just made this at home, to test it out for camping. I used a large/wide iron skillet, like the video, which was just right. It turned out really good. Here are some of my thoughts/tips on improvement for next time around. I would use a little more meat (2/3 to 3/4 lb). I couldn’t find strip steak at the store, so I bought a New York steak and cut it up, which was a perfect cut of meat for this meal since it’s so tender. Also, I added 2-3 tablespoon of butter when I cooked the mushrooms (you can add more oil if you don’t have butter), since they will burn if the pan’s too dry. I used fresh chopped thyme leaves, but I would imagine dried thyme would also do. When adding the egg noodles, the bag said 6-8 minutes, but mine took 11 minutes since the liquid did not cover them completely. Because of that, I covered them on & off with a lid, to prevent too much evaporation and better cook the noodles, so bring a lid just in case. My family absolutely loved this one (and they are picky eaters), thank you! out there has tried both soy or worcester sauce, which sauce would you recommend? I also added 2 cloves minced garlic with the onion. We have never regretted adding garlic to a recipe! Awesome! We’ve made a veggie version of it too! The mushrooms are kind of the best part. We discovered your blog a few weeks ago and thought your recipes all sounded amazing! 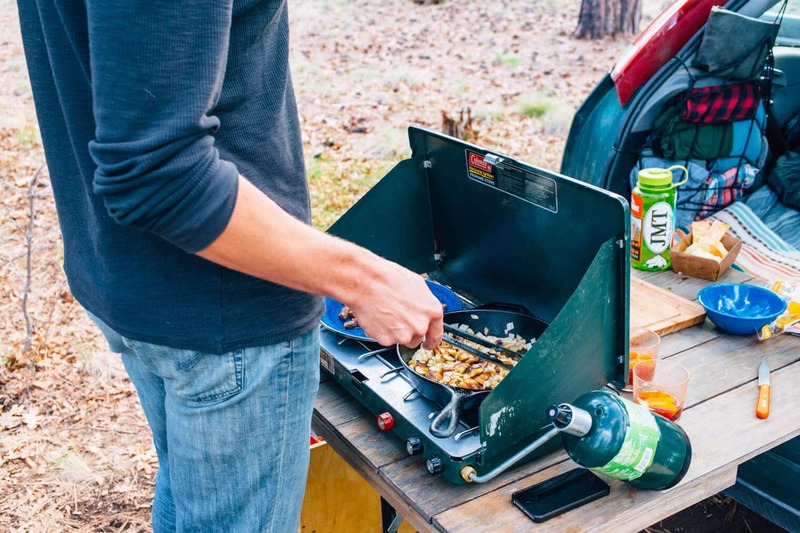 We just made this recipe on a weekend car camping trip and it was so good! Even my 2 picky kids liked it! We want to try the chilequiles next! whats the drink pictured in the shots ?. looks delicious. Definitely one of our summer favorites! 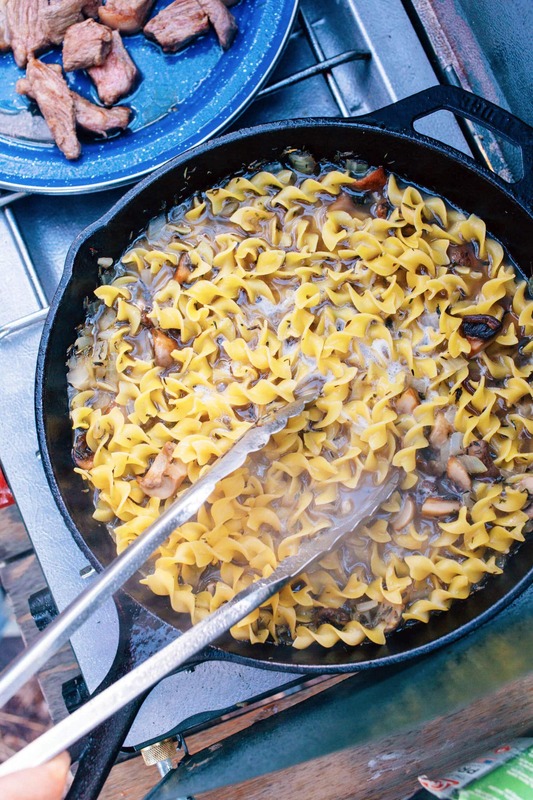 This was the first recipe I tried and it was the perfect meal for a VERY cold camping trip. This was a great pick-me-up after a full day of climbing in the cold! I can’t wait to try more of the recipes! Thank you!! Ideas for a veggie version? Or just omit the steak? Thanks! Yes, this could easily adapted to be vegetarian! Omit the steak and use veg broth, and bump up the mushrooms – maybe a pound instead of 8oz as listed? If you want some extra umami flavor (though the mushrooms + soy sauce should contribute!) you could always increase the soy sauce a bit (maybe reduce the salt in that case) or use liquid aminos. Hope you enjoy it! We’d love to hear how you modify it and what worked! Thanks for the tip about the broth and yes, the boys use BIG Dutch ovens to cook. If you ever get to Florida check out the Florida Wildlife Corridor and Bigfoot Natural Wilderness. The boys hiked in (everything on their backs), but I’m sure there must be car camping spots. It’s real Florida. And look into the various springs like Ginnie Springs. Just found your blog this week and am very much enjoying it. I’m learning quite a bit and enjoying see parts of our country so different from where we live in Florida. This recipe looks great – my 12 year old will have to test it out and see if he can multiply it several times to cook for his Boy Scout troop. Thanks, Marianne! This country’s landscape is SO incredibly diverse – and we haven’t even hit the Midwest or the South yet! I imagine that this recipe would be a good candidate for multiplying – especially if his Boy Scout troop has Dutch ovens. I think the trick would be to make sure that the water/broth doesn’t *quite* cover the pasta, and then stir the pasta frequently to make sure it all cooks evenly – otherwise the sauce might end up a little thin. But, I think it’s a pretty forgiving dish. I’d love to hear how it works for them!